Green flag, Custer gets the jump on the inside line. Christopher Bell follows him through. Bell looks to the inside in turn one. He leads from row two. Lap 20, Christopher Bell leads Custer by 2 seconds. Christopher Bell takes the win in stage 1! Christopher Bell leads the field to pit road. He’s first in and first off, four tires for the field. Green flag on stage 2, Bell gets a shove from teammate Brandon Jones on the inside line. They’re both clear into turn one. Three wide for 3rd. Briscoe and Gragson nearly wreck on the front stretch. Lap 70, Tyler Reddick is climbing through the field. He’s fighting back after issues on pit road. He’s climbed through the entire field and he’s running 5th. 5 to go, Christopher Bell leads Custer by 4 seconds. Christopher Bell takes stage two. That’s the first time in his career that he’s swept stage one and stage two. Justin Allgaier is banging into John Hunter Nemechek on the cool down lap. He was not happy that Nemechek took his lane away. The field heads for the pits. Brandon Jones beats Bell to the pit exit. Bell stabs the brakes, he allows Reddick to take 2nd so Bell can start behind his teammate on the inside line. Penalty: Brandon Jones is handed a pit road penalty. He’ll go to the tail. Green flag on stage 3, Reddick leads on the inside line. Bell falls quickly but fights back to 2nd just as quick. Lap 92, Bell heads for the top in turn 1. He has a run off the corner. He’s at the right rear of Reddick. He leaves the lane open and Bell drives to the lead on the outside. 42 to go, Michael Annett is the first car to the pit lane. 41 to go, Reddick pits from 2nd. 40 to go, Christopher Bell hits the pit lane. Bell is slow on the right rear change. 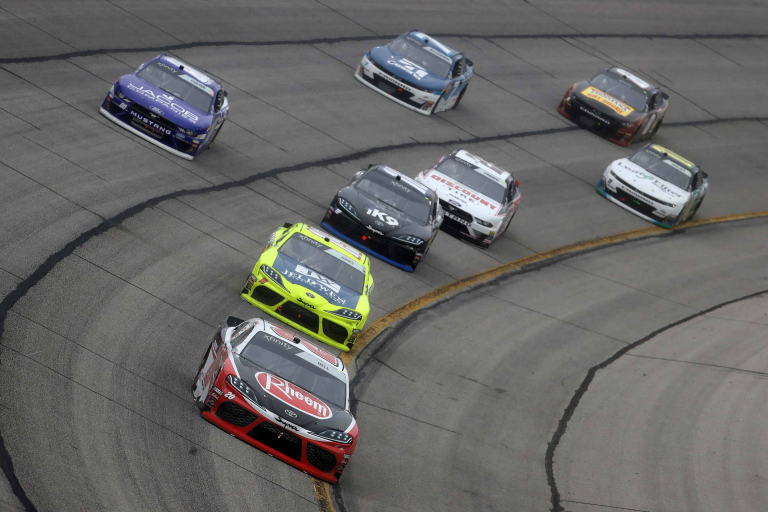 38 to go, Riddick, Bell and Allgaier are three wide on the track. This is the race for the lead when the cycle is complete. Bell cruises around on the outside of all to retake the positions lost on the pit lane. 31 to go, Gragson pits from the lead. Bell cycles back to the race lead. He leads Allgaier by 1.4 seconds. 21 to go, Bell leads Reddick by 1.5 seconds. 17 to go, Reddick has cut the gap to just 0.65 seconds. 10 to go, the gap is now 0.7 seconds. Reddick trails Bell on the track. Both cars remain on the bottom lane of the race track, all the way around the track. But, now he’s in dirty air and it’s harder to make up lost ground. 9 to go, Bell is loose all the way through 3-4. Reddick closes the gap to 0.4 seconds. 8 to go, John Hunter Nemechek is around from 9th. He lost it on his own off turn two. The field heads to the pit lane for a shootout finish. Bell is first in and first off. Jeffrey Earnhardt is off in 2nd. Reddick has issues with the air gun, he falls to 6th at the pit exit. Green, Bell gets the jump. Allgaier moves to 2nd. Custer cuts to the bottom, he takes 2nd away. 2 to go, Custer is on the bumper of Bell! 1 to go, they both head for the top in turn one. Bell to the bottom in turn 3, Custer to the top. Christopher Bell wins the Atlanta Xfinity race! 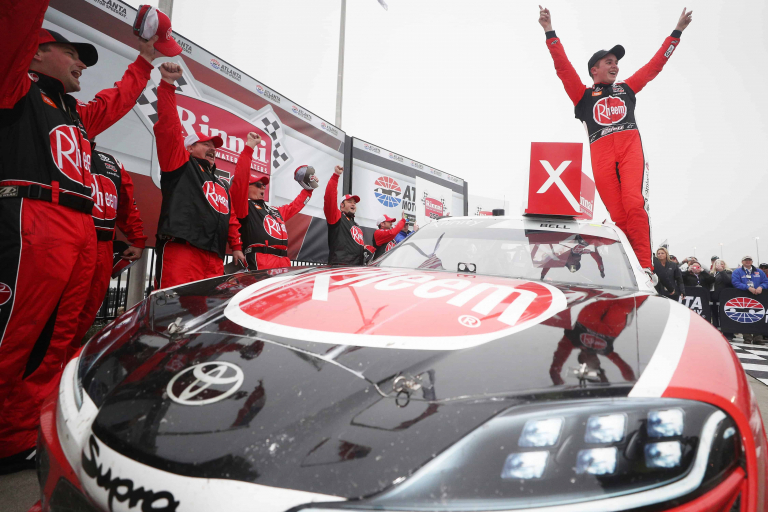 That’s the first NASCAR wins for the Toyora Supra. 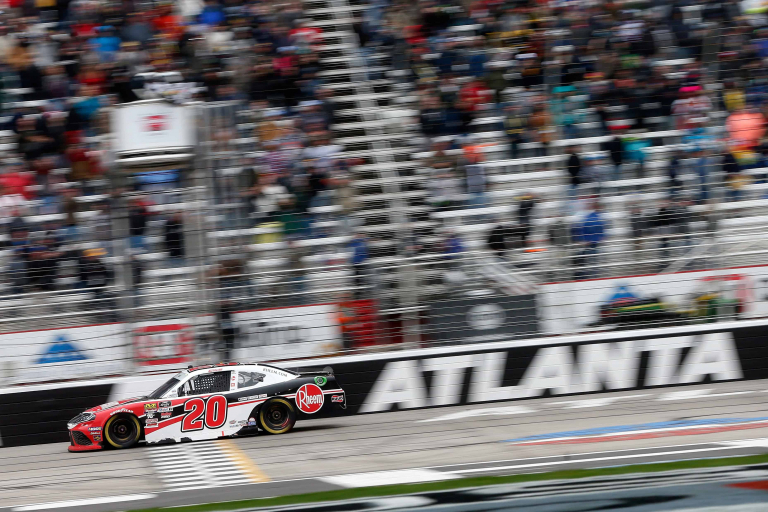 View full Atlanta Xfinity Series race results below.